Red Door Home: Living Room Finished! I am happy to say my living room redo is finished! (Well at least as finished as it is going to be for a little while! Things tend to change quickly around here so I don’t want to make any promises.) 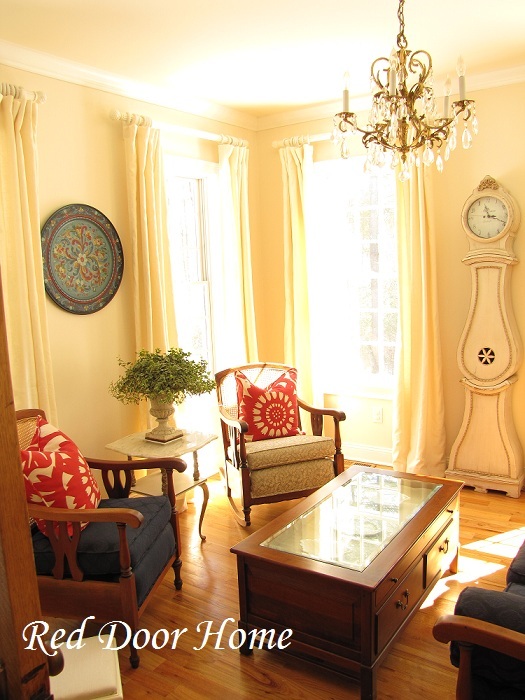 The final pieces of the puzzle – curtains and a lamp – have been added and I could not be more pleased with the result. Here is a look back at what the room looked liked before. Here is what the room looks like today. I finally found time a few weekends ago to finish the curtains. For new followers, these are the second set of curtains I have made for this room over the past several months. (You can read about what happened to the first set here.) The fabric had been sitting in a closet for several weeks and I had been going back and forth as to how exactly I wanted to make them. I thought about making a scalloped edge, adding some sort of decorative trim or even sewing a stripe of colored linen to the top. In the end, I continued with the “simple is better” theme of this room and decided on plain panels. The lamp is from the same shop as my recently acquired orange chairs. 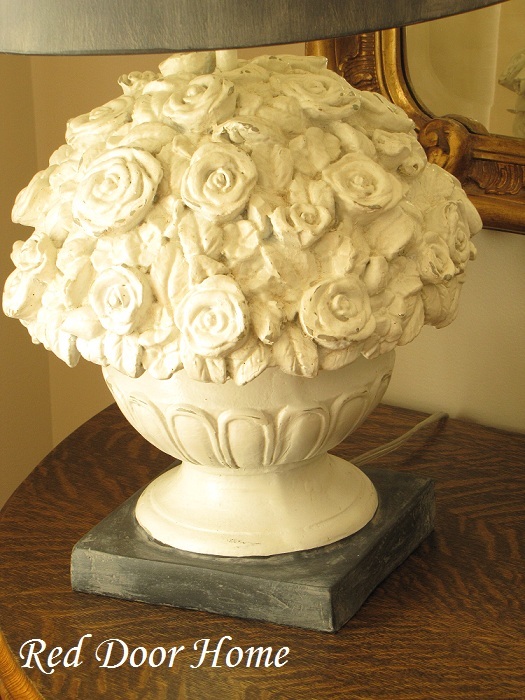 It looks like stone – although I think it is resin – has a gray metal shade, and is a much better fit than the previous brass lamp which used to occupy this space. The best part to me about this room makeover is it was more about taking things away rather than adding them. The room is lighter, brighter and just all around more representative of the current décor in my house. Note: I have not forgotten about the promised “How to sew curtains with lining” tutorial. I am almost finished with the writing and should have it up soon. This is lovely. So calm and peaceful. I'm adoring the pillows on the fabric. Such a great pop of color. Your room looked beautiful before, but it also looks beautiful now. I do like the lighter, brighter look. I have done away with my bold colors also. Beautiful! I love how light it feels now. Also, this Norwegian girl loves the platter with the rosemaling. How beautiful is it on that light background? The room looks beautiful! 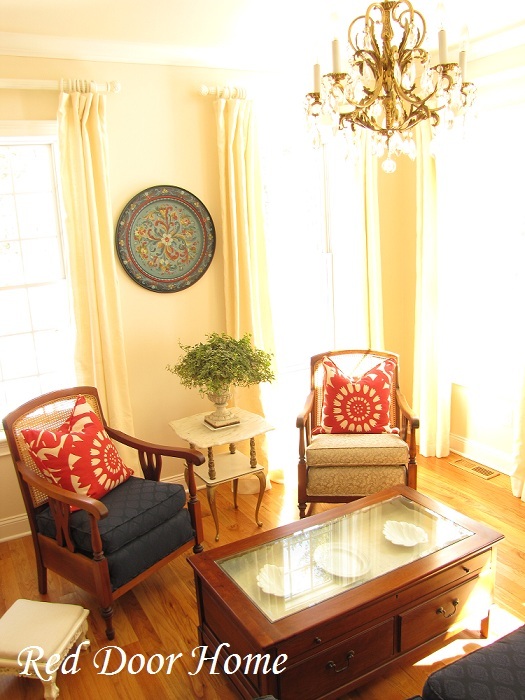 It is amazing how changing the colors to a lighter palette makes the furniture and accessories so much more richer. I love that lamp, resin or not, it is cool and unique. It's so light and bright, Stacy! How are you liking the wall color now that you've lived with it for awhile? I'm sure it takes some getting used to when you've had a darker color up for a while. I've been loving all the lighter colors I see in the homes of the blogs I follow. I have a feeling I'll be going down that road myself! Hi Stacy, this transition to light is so beautiful (though I liked the before, too :. The lamp is fantastic with that ornate mirror behind it. The drapes are perfection, plain! They are so lovely. What is the header? I love the transformation. I used to have a red livingroom too and mine has been replaced with a lighter, airier color, but I'm ready to change it to a different (still light airy) color again. Looks like you just finally opened up the room and let that sunshine in! Stop by and visit my blog sometime too if you get a chance! Beautiful. I can see reading a good book or magazine in that room. I love it, Stacy!!!!!!!! beautiful and light and refreshing! I love the tranformation - much simpler and brighter now. Those printed through pillows in red are fabulous! LOVE the brighter look! Looks impeccably fresh. The chandelier is gorgeous. Great job! I love the new look and I think the room turned out beautifully. Wow, you living room is fabulous. Very classy and elegant. Love everything about it!! Hope to see you at My Dream Canvas! Have a great day. I love the room transformation, Stacy! 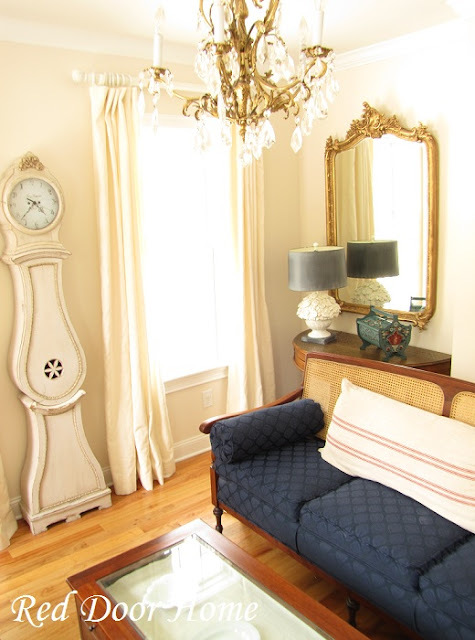 The lighter paint looks wonderful and I love the clock and mirror. Great job on the drapes. Thank you for sharing your pretty room at my Open House party. Stacy! I really love, and I mean LOVE, the room. I too would have been tempted to add something to the drapes but really, I think you made the perfect choice keeping them "simple". I have been lusting after some cane backed chairs and your lamp is spectacular. Looks great! Love those chairs and the pillows. 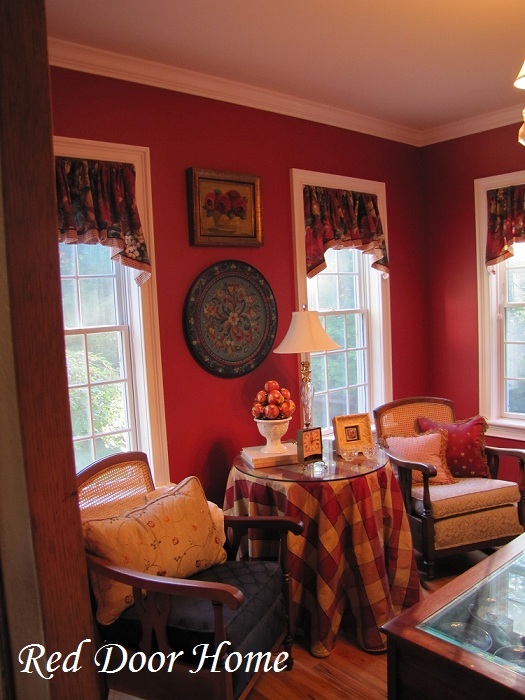 I just "shed the red" throughout our house for a lighter, more neutral look. Hi Stacy! I love how your room turned out! So fresh and elegant! Beautiful. Stacy, it is a beautifully edited room. The lighter palate really opened up the space. Seriously, I do not think this room could be more beautiful! I love all the light and the accents you have! Now I really want to lighten up my red dining room! Incredible job! Stacy I love this room. It is so much nicer in the lighter tones. I just love your Mora clock! It's beau-ti-ful! As much as I love dark wall colors I really like the lighter color you moved to in your space. I'm sure you're thrilled to have all the work behind you. It's so satisfying to finish a project, isn't it? Stacy: This is really nice and so updated and just so fresh and clean! I love red walls, but now the space is so much lighter...very nice job! gorgeous! Oh how I covet that lamp, it's wonderful.Happy Friday,Happy Good Friday, Happy Earth Day, Happy Jelly Bean Day ( yes it's actually jelly bean day)Hugs from Katherine. P.S have you entered my giveaway? Your room looks so nice. I love your light fixture. It's all really beautiful Stacy. Simple changes but a big difference. The round tray shows up so much better now. I hardly noticed it in the before shot. Your room is lovely! Your colors are perfect and I love your clock! Your living room looks light, bright and beautiful, Stacy! I am in love with your chandy and clock! Wow, what a pretty and peaceful room. I am amazed. I love your clock. Oh, I want one. This is so great. FAB job!!!! How pretty - love the lighter color. Did you or a relative paint the round piece between the windows? Everything is perfect. Dropping by from BNOTP. love it! 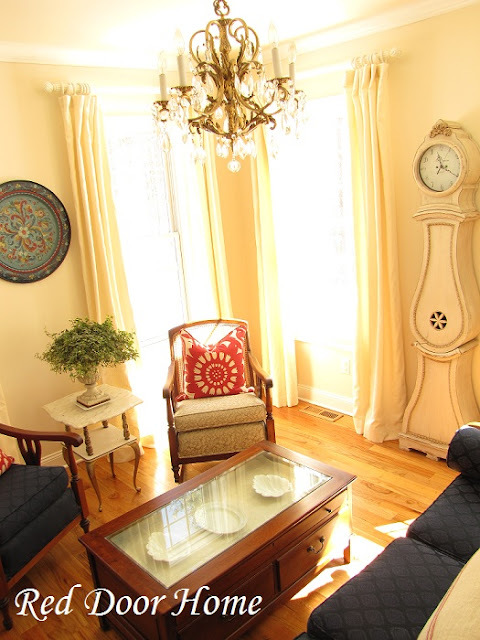 the furniture is great, love the clock, what a different feeling with the new paint. Red is a doozy to paint..Nice project and post.Thank you for sharing your inspiration. 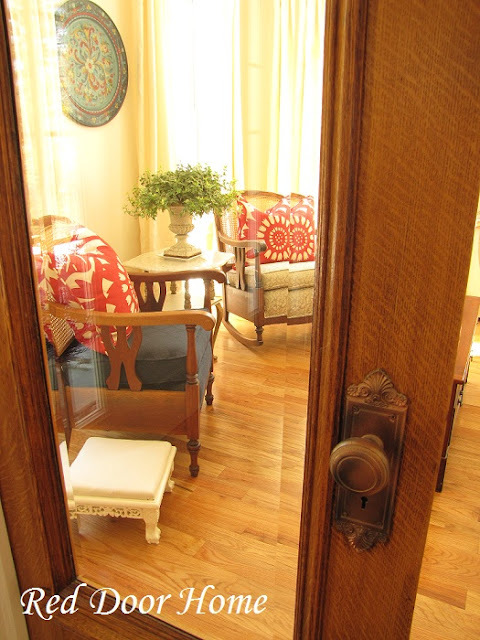 It's amazing what color can do for a room ~ love the transformation! Stacy!!!! This room is BEAUTIFUL!!! I absolutely adore everything that you did. It is so fresh and lovely to look at, and so welcoming in feel. I want to sit on the sofa and chat with you (can I have a glass of wine too;)! Wonderful!! This is fabulous! 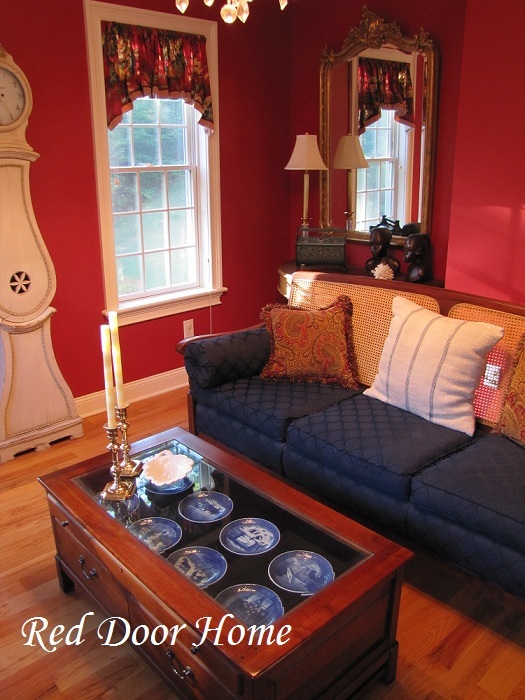 Love the clock and the pops of red! Gorgeous! I do love the colors you used here. 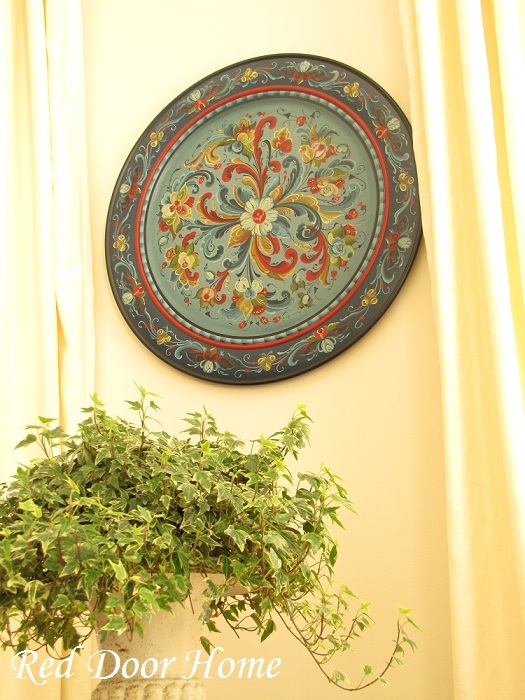 But what I love most is your Rosemaling piece. Where did it come from? I adore Rosemaling. It really pops in the room now. Gorgeous! I am so inspired now. I'm dying to repaint my dining room and this may have just pushed me over the edge:) I love your panels as well. I'm a simple panel girl all the way! Simply elegant and gorgeous! Lovely colors. Beautifully done. Gorgeous! What a transformation! I love all the carefully chosen details. This is a beautiful transformation! The pop of color on the pillows and wall plate are just perfect.